Whew! What a long, amazing weekend!! 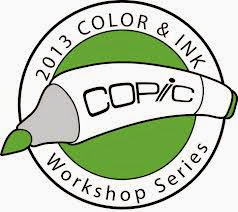 I was lucky enough to be able to attend the 2015 series of copic workshops. They were almost cancelled this year due the the Pope visiting Philadelphia this year. The city was over flowing with people preparing for the Popes arrival. It was impossible to find reasonable hotel rooms and the streets were full of people. Thankfully, I was able to sneak out of the city before they closed the roads. There were three topics being covered this year. I had taken the Hair and Skin class last year, but they were offering a new variation on what they did last year, a vintage class, and fabric class. Here are my two favorite images from the Hair and Skin class. I wasn't sure what to expect from the Vintage class. I usually do not do a lot of work in sepia or black and white. I was surprised how much I liked the end result. It was surprising how challenging it was to choose colors. You think you are working in monotones and it would be easy. However, in order to get good contrast you need to plan a head and really understand the shadows. My favorite part of the two day event was the fabric class. I have been experimenting with fabric on my own, but this really helped pull it all together. I have so many ideas bouncing around my head...I can't wait to try them. My favorite is the little genie. Thanks for looking. I can't wait to take what I learned and apply it to my own images. Stay tuned!! Wow, you learned a lot. Your examples look great! These are so beautiful and inspirational! Thank you for sharing your knowledge, and spreading the desire to improve.